There should be a ban on teaching creationism as a science in schools, according to a group campaigning for the separation of church and state. The Scottish Secular Society called for clear guidance on how religious theories about the origins of life are taught. It highlighted concerns over two recent incidents in Scottish schools. 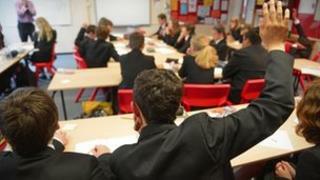 The Scottish government said it was for headteachers to decide what links schools should have with faith groups. The Scottish Secular Society said it had no problem with students understanding that not everyone accepts the theory of evolution, and that there are other beliefs about the origins of the universe, the earth and life. But it said the only place for creationism and intelligent design in Scottish schools was "within a discussion context in religious and moral education classes". The society said clear guidance would bring Scotland into line with England and Wales, where the presentation of creationism, intelligent design and similar ideas as scientific theories is already prohibited in schools. Its letter followed two recent unrelated incidents which, the society argued, demonstrated there was a risk of such theories being presented to children as scientific fact. Children at a primary school in South Lanarkshire were given books donated by the Church of Christ as a gift to take home. The books debunked evolution and advocated the Church of Christ's belief that the earth is a few thousand years old. Illustrations in the book showed humans and dinosaurs living alongside each other. After protests from parents, the council launched an investigation into management practices at the school. The headteacher and her deputy were moved to other duties in the education department. Separately, a parent in Midlothian complained after a physics teacher at a secondary school was alleged to have told a student he did not accept some of the science he was expected to teach because of his Christian faith. The teacher is due to retire in a few months. A Scottish government spokesperson said: "It is for a head teacher to decide, in full consultation with the local authority and wishes of parents, what links a school should have with its local faith communities."